Anna M. Robbins (ed. ), Ecumenical and Eclectic: The Unity of the Church in the Contemporary World: Essays in Honour of Alan P. F. Sell (Milton Keynes: Paternoster, 2007). xiv + 313 pages. ISBN: 978 1 84227 432 3. Review copy courtesy of Paternoster/Authentic Books. Anna M. Robbins is a lecturer in Theology and Contemporary Culture at the London School of Theology. She completed her doctoral work under the supervision of Professor Alan Sell, and has continued to benefit from his work and friendship. Thus it is entirely appropriate that she gather together this volume of fifteen essays dedicated to honouring the ministry of Professor Sell. And it is entirely appropriate that this volume be published in this series of Studies in Christian History and Thought, a series to which Sell has been a contributor and of which he is one of the editors. My appreciation for both Professor Sell’s work and for the series in which this particular book belongs has already been noted here and here. 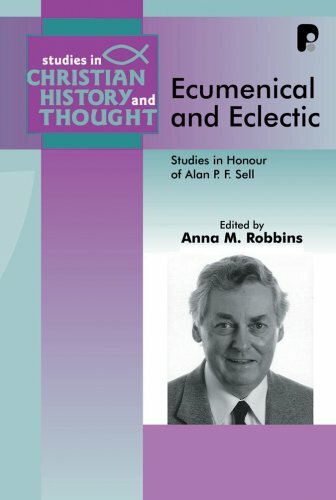 The diversity of essays – their themes and countries of origin – is itself a significant reminder of the testimony to the influence and interests that Alan Sell has so faithfully dedicated his energies towards: Reformed theology, ecumenism, philosophy, nonconformity, church history, mission, ethics and apologetics among them. As the introduction to this volume notes, ‘Throughout [Sell’s] work, he has sought to expose unsatisfactory divisions amongst the people of Christ, to pose necessary challenges to those who hold sectarian attitudes, and offer constructive proposals for ongoing dialogue and other expressions of unity’ (p. 1). The essays in this volume are organised in three movements. The first, ‘Ecumenical & Eclectic: Roots’, includes essays by Donald McKim, D. O. Thomas, Martin Fitzpatrick and Andrew MacRae. McKim begins his essay as many of the contributors do, by acknowledging his appreciation for Sell’s work and friendship. He writes of Sell, ‘There is no one I respect more as a theologian and whose work I appreciate more as a Reformed theologian’ (p. 7). High praise indeed. The essay proceeds to consider how some Reformed foundations serve the unity of the Church. Specifically, that the unity of the Church is Christ and is from God, that it is a unity of faith, that it is unity that acknowledges diversity, and that it is a unity that is both given and sought as divine gift. Unsurprisingly, and appropriately, McKim draws heavily from Calvin. Thomas’ essay examines the nature of the distinction between abstract and practical virtue in the thinking of Richard Price, again with an eye on the question of Church unity in the context of dissent and divine authority. Fitzpatrick too proffers a number of philosophical reflections on unity and dissent. Surveying the thought of the unitarian Joseph Priestley, and the eighteenth-century Rational Dissenters, Fitzpatrick argues how dissent may actually contribute to the unity of the Church. The final piece in this section is entitles ‘The Power of Christian Unity’. Here, Andrew MacRae, with an eye on both Scripture and more recent ecumenical developments, proposes a theological exposition on the power of Christian unity. His argument is that there can be multiple brands of ecumenical movements, all of which may contribute to the unity of the Church without being intrinsically divisive. Cornick’s essay proceeds to explore her contributions to prayer (principally through her 1943 book, The School of Prayer), vocation and ecumenism. He notes that Wyon begins her exploration of the relationship between prayer and Scripture with the Barmen Declaration: ‘The Bible deals with God, and with nothing apart from God. Whoever seeks God in the Bible will find God there; for God comes to seek and find us in His Word…’. This, Wyon argued, is the core of the relationship between Scripture and prayer. Cornick comments on Wyon’s urging: ‘Being alone with Scripture and taking it seriously is a dangerous business, for we meet with Christ there. In his light we find ourselves judged and can “suddenly … find that Christ steps out of the pages and confronts us with an absolute demand”. Being alone with the Bible means risking a revolution in one’s life. That sounds austere and frightening, but judgement is merely the obverse of salvation; so Scripture also leads us to a knowledge of the trustworthiness of God, of forgiveness and mercy and “infinite support”‘. Citing Wyon, Scripture is the ‘springboard from which we may dive into the fathomless ocean of the love of God’ (p. 151). Cornick notes that Wyon was an exceptionally well-read theologian, who gently corrected the tendency towards individualism which is so characteristic of Western Protestantism by stressing the way in which the New Testament always speaks of the priestly activity of the whole church. ‘It is the whole church which is intended in the good purposes of God to bring God to humanity and humanity to God’ (p. 156). The next essay is from the pen of John Tudno Williams who considers two Welsh New Testament scholars – namely C.H. Dodd and W.D. Davies – and their contribution to thinking on the nature and unity of the Church. Peter Ball, Chair of New Testament Studies at Károli Gáspár Reformed University in Budapest, contributes a paper on whether it is parents or Christ who have the foremost authority in the family and what it means for how children should honour their parents. He asks ‘Did the first Christians fulfil the expectation to honour their parents?’ (p. 175). The final contribution in this second section comes from lrving Hexham, who considers the work of Weber and Troeltsch with respect to the development of the grammar of ‘sect’ and ‘cult’. He concludes that such language is sectarian and ideologically loaded, and so ultimately unhelpful. … it means that the knowledge that the effects of our sin reach into the very heart of God overwhelms us. Is that what prompts the tears of worshippers in the theatre pews when they view this film? How else do we know ourselves to be the sinners that we really are unless we see our hand in the very crucifixion of God? And hear from the Victim’s lips, ‘Father, forgive …’? No power in this world can so drive us to our knees. Only this Power of the divine powerlessness, the Christ who reigns from the cross. The fishhook-bait analogy has yet another meaning. The Devilfish did get caught. The power of God in the powerlessness of Jesus accomplished its purpose. So Aulén, interpreting Irenaeus, says: ‘The redemptive work is accomplished by the Logos through the Manhood of His instrument, for it could be accomplished by no power than by God Himself.’ Can we put it this way? God stoops to conquer. God comes into our midst in human form in Galilee and on the road to Calvary in order there to expose us for who we are. We see first-hand One who is as we should be and strike out at this embarrassing Presence. Yet it is, paradoxically, only through our lacerating and crucifying ways that God can disclose as well as expose, disclose the suffering Love that makes reconciliation possible. The proper emphasis on the suffering of Jesus when it excludes the suffering of God constitutes the discontinuity Aulén rightly criticizes. Without making the mistake of this discontinuity, we can yet affirm the concern to preserve the role of the humanity of Christ in the Work of salvation, while knowing that it was the God who was ‘in Christ’ who evokes our repentance and brings forgiveness to the sinner. (pp. 280-1). Like most edited volumes, Ecumenical and Eclectic is not immune from its weaker contributions. However, every essay bears witness to something of the work of the one to whom it is meant to honour, and has something important to donate in its particular area of concern. Unfortunately, there is no essay devoted to theological education, an area which Sell has contributed not a little. That said, those interested in many themes that so interest Alan Sell will not be disappointed with many of the papers in this book. It also includes a comprehensive 27-page bibliography of Alan Sell’s work.